Windows Phone 8 users, rejoice! 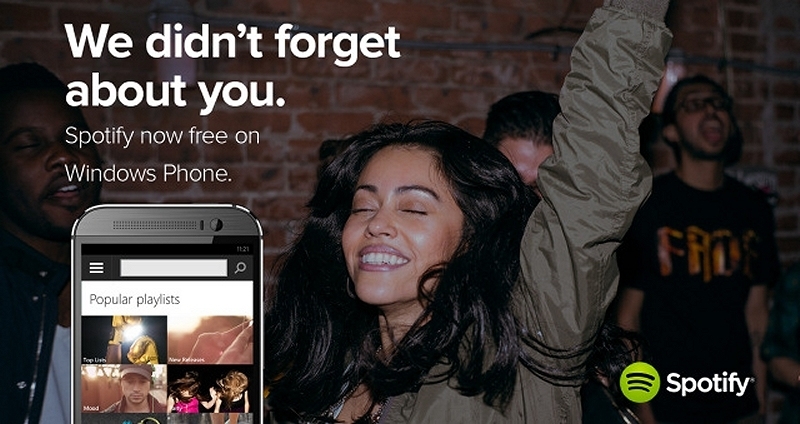 Spotify has finally got around to enabling free, ad-supported music playback on its Windows Phone 8 app. Better late than never, right? The Spotify app for Microsoft's latest mobile operating system debuted a year and a half ago albeit without the free playback feature. Android and iOS users, meanwhile, have enjoyed free tunes since December which has led to some less than favorable reviews of the app on the Windows Phone Store. While free music playback is no doubt the flagship feature of the update, it isn't the only thing Spotify is addressing with their latest update. In a blog post on the matter, Spotify said search results should now look better than ever and they've made it easier to browse artists and discover related artists. It's not the massive UI overhaul announced in April for other platforms but again, it's better than nothing. Of course, Windows Phone 8 users still have the ability to upgrade to Spotify Premium which does away with the advertising and allows offline playback of downloaded tunes. Expect to pay $10 per month for the opportunity. Microsoft has struggled to compete with industry giants Apple and Google, not because their operating system is inferior, but because they don't have a big app draw. The Redmond-based company's app store is growing but they still have a lot of catching up to do. Those that already have the Spotify app will simply need to install the latest update to enable the new functionality.